Fleas that used to get eradicated easily using Frontline or Advantage are now gradually becoming immune to these products. Some of them have even developed resistance to the standard treatments used for flea elimination. However, the number of such fleas is still less. The main reason behind recurrences is rather the presence of fleas that lurk in the environment. These fleas require moist and shady places to hide and thus they wait in the suitable spots for the correct time to latch on the pet. If stats are to be believed, only 5 percent of the fleas live on pets, rest of them like – Flea eggs and larvae lurk in the environment. So, the most important step to eliminate fleas completely from your life is to first eradicate them from your pet and then remove them from the surroundings. Follow these guidelines to get rid-off fleas forever. If you have been using Frontline or Advantage for a quite a while now, change them right away. Though Frontline and Advantage still work perfectly for maximum pets, there is a percentage of animals for whom these products don’t work that efficiently because fleas have developed resistance against these treatments due to their prolonged usage. If that is the case with your pet, it is better that you switch to stronger products like Bravecto, Simparica or Nexgard that are new for fleas and have proven their efficacy against heavy infestations by fleas and ticks. 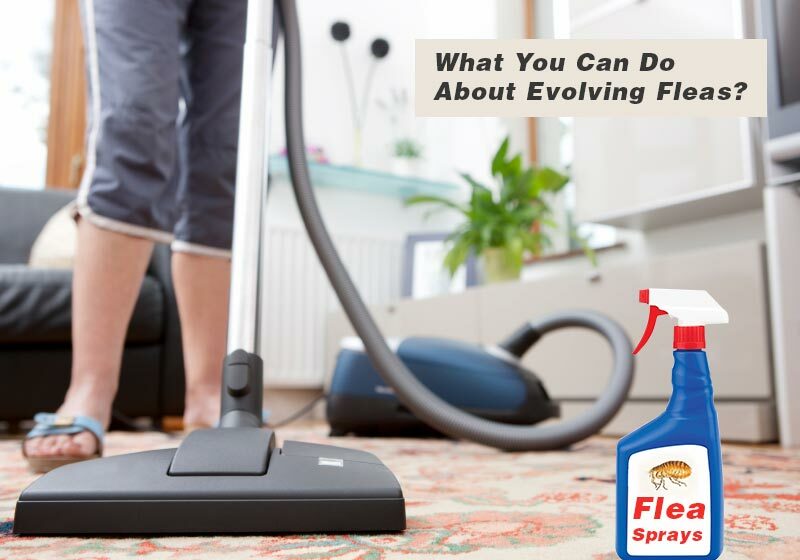 Since maximum fleas( flea eggs and larvae) dwell in your house than on your pet, you must vacuum your space weekly. These nasty parasites huddle in the corners of your furniture, on the pet’s bedding, couch or carpets hence it is really necessary to thoroughly dig into these corners with your vacuum pump. Make sure you dispose the vacuum bag away from your vicinity. Pet’s bed can be the breeding ground for fleas and thus you must wash it almost every third to the fifth day to eliminate flea dirt. Other than that, your own clothing and bedsheet must be regularly washed because you continuously come in contact with the infested pet. Flea spray comes in two forms – one for the use on pets and the other one for the household purpose. It is beneficial to spray your dog with the pet flea spray every time he visits outdoors to avoid picking up an infestation from the foreign area and bringing it to your house. Also, spray your household to kill the eggs and larvae that could have fallen from your pet’s body. Regular use of this product can be very beneficial in keeping the infestation at bay. Even though a few percentages of fleas have developed resistance against the most renowned products in the market, it is ultimately our own actions that are responsible for the prevalence or elimination of fleas. It is only through continuous efforts to keep our surroundings clean and using the right products to treat our pets that we can combat even the heaviest infestation in our pets and households. Therefore, keep yourself updated about the changes in the flea world and what ways you can explore or follow to prevent the infestation in the first place. Well, a quick advice – use the flea preventatives year round. It will eliminate even the minutest possibility of your pet catching fleas. Don’t forget to stay alert about flea news around the world. The galloping and neighing of horses make the environment vibrant, filling you up with new energy. Riding on your horse especially when he is quite healthy just brings you a great pride. However, out of blue, if you suddenly find that your horse is vomiting or has lost weight then it’s a wakeup call for you to find out what’s wrong with your gladiator. These are the signs that your horse show of being infected with worms. It has the most damaging effect and can be fatal at times. Worms impact the proper growth and development of your horse. Especially in racing horses, the performance usually gets impacted badly and this definitely means that a concrete shield is required to help guard them against the most treacherous worms. 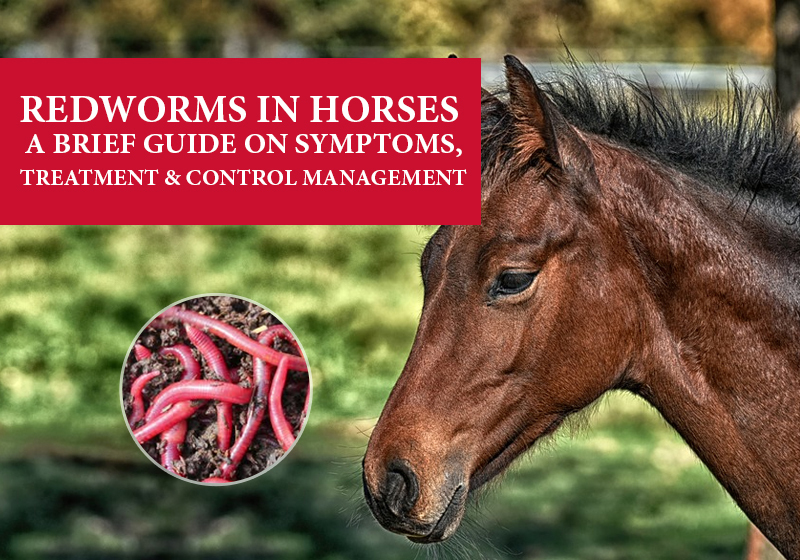 The most common chronic disease that horses get infected with is redworms. It is a common name given to a group of worms namely small strongyles or cyathostomes. These worms similar to bloodworms, though not as much deadly as bloodworms, can create intense health conditions in horses. Heavy infestations can lead to severe ill-health and if a worm control program is ignored or not acted on, the overall effect may be much devastating and at times can be fatal. Your horse may become chronic ‘bad doer’, and in some cases, the infestation may be fatal. The elimination of redworms in horses is quite simple and common redworms are highly effective in treating these worms. However, immature forms of the larvae are too hard to treat and at times go untreated. Therefore, for effective control of redworm infestation, it is crucial to treat your horse on a regular basis. 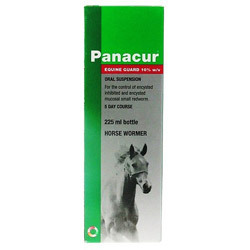 Treatment with Panacur equine guard can aid in the protection against recurring redworm infestation when used regularly. Normally, vets recommend treating your horse during spring and fall, which is the peak season of contracting redworms. Proper care, scheduled redworm treatment, and cleanliness in the surroundings will aid in preventing chronic redworm infection in horses. There are a few things to consider for the full proof worm control management program. Always have a look where you allow your horse to graze. If the paster is loaded with other outside horses or farm animals, consider feeding your own grass. Regular deworming is the best prevention that you can follow for your horse. Some types of redworms, within six weeks after emergence into the intestines, may begin laying eggs. Therefore, a six weekly worming interval will be practically effective. The most concrete step that you can follow is to treat mares and foals on a monthly basis with horse wormers (redwormers) and schedule a six weekly treatment for all other horses with an oral wormer.